$75 Pennsylvania do-it-yourself divorce kit: uncontested no-fault forms | Pittsburgh Family Law Services, P.C. BUY THE KIT THAT DOESN’T LEAVE YOU STRANDED. STUCK? WE’LL HELP! 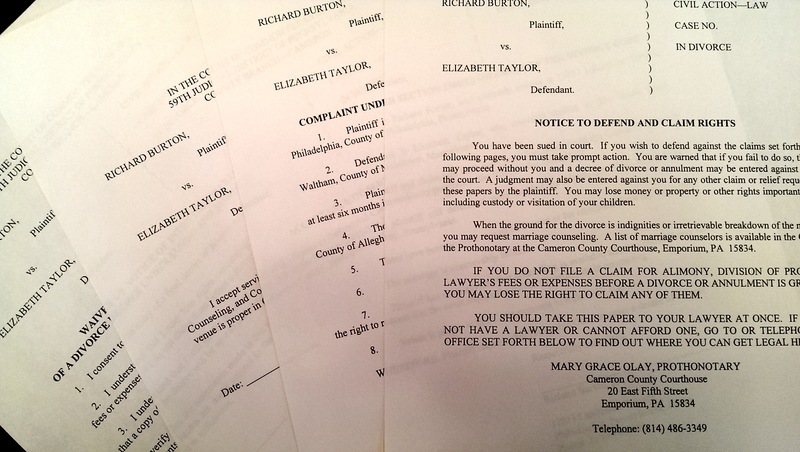 Complete set of Pennsylvania uncontested no-fault divorce forms with instructions. The most affordable divorce in Pennsylvania is the one you do yourself. Complete set of lawyer-prepared uncontested Pennsylvania no-fault divorce forms and simple instructions, guaranteed to work. You will file everything by mail from anywhere in Pennsylvania. You will NOT have to appear in court. You will file your divorce in Cameron County, where the filing fees are so low that using our forms will save you more money than they cost! WARNING: IF YOU HAVE A HOUSE TOGETHER, A PENSION TO DIVIDE OR ANY OTHER UNRESOLVED ECONOMIC ISSUES, YOU SHOULD TALK TO A LAWYER BEFORE PURCHASING AND USING OUR NO-FAULT DIVORCE DOCUMENTS. A PENNSYLVANIA DIVORCE DECREE ENDS ALL SPOUSAL RIGHTS THAT YOU HAVE NOT PROPERLY PROTECTED. All Pennsylvania divorce forms and court correspondence professionally pre-prepared with YOUR information. Complete and easy-to-follow step-by-step instructions. Full and FREE professional customer service to ensure success the first time around. WHEN YOU ORDER, PLEASE BE SURE TO CHECK YOUR SPAM FOLDER OR TO ADD EMAIL FROM “PGHFAMLAW.COM” TO YOUR SAFE-SENDERS LIST. WE WANT YOU TO GET YOUR KIT! We will deliver your divorce forms and complete instructions as printable documents via email. Upon request we will gladly send you a printed copy instead via USPS Priority Mail, for an additional $10 charge to cover the cost of shipping and handling. PENNSYLVANIA DIVORCE PAPERS ARE AVAILABLE EVERYWHERE. WHY BUY OURS? Pennsylvania uncontested divorce kits and sets of divorce forms are all over the place, and if you look hard enough you might even be able to find divorce papers for free download. Finding them isn’t much of a challenge. The hard part is, what are you supposed to do with them? We take away the guesswork. Step-by-step, our easy-to-understand instructions walk you through the process. Need extra help? Pick up the telephone instead of your wallet. We are a working Pittsburgh divorce law firm with over 20 years of experience. We can make this happen for you. You and your spouse are in complete agreement to divorce. You and your spouse will sign all necessary documents. Either you or your spouse (it only has to be one of you) has resided in Pennsylvania for six months or more at the time you file. You do not know how to contact your spouse. Neither you nor your spouse live in Pennsylvania. Your spouse will not sign the necessary forms. You have unresolved property or spousal support issues (including pension claims). You want to file a written agreement with the court relating to property or children. Your spouse is on active duty in the U.S. Military (any branch). Either you or your spouse has already filed for divorce in another county or state. Please be aware that in Pennsylvania, divorce is about economic closure rather than personal closure. There are rights that arise from your marriage — such as identification and distribution of marital property and debt, and alimony — that must either be claimed before a divorce is final, be protected by a written agreement with your spouse, or be waived forever. Before you decide to purchase this kit, be sure that neither you nor your spouse intend to make any such claims. Additionally, if you are presently covered by your spouse’s medical insurance, the award of a divorce decree will bring that to an end. If you are in any doubt about your rights or about your needs, you should seek a consultation with a local family law attorney before you proceed. Purchase and/or use of this kit, including calls for office informational assistance, does not create a lawyer/client relationship between you and Pittsburgh Family Law Services, P.C. nor with any attorney associated therewith. Every court in Pennsylvania charges fees to accept your divorce forms for filing, and you will pay the court a total of $109.75 after you have purchased our kit. The odds are strong that even adding in the $75 cost of our Pennsylvania divorce paperwork, you will pay less for your divorce than if you filed it in your home county using free divorce forms. You don’t have to take our word for it; do a web search for “[your PA home county] prothonotary fees,” and see for yourself. The cheapest available Philadelphia County divorce, using free forms, will cost you close to $400 in filing fees. The cheapest Pittsburgh divorce with free forms will cost close to $210. In Erie, your free-forms divorce costs over $220. In Scranton, about $200. In Harrisburg, over $330. In Cameron County, including the cost of our custom-prepared forms, $184.75! THIS SEEMS TOO GOOD TO BE TRUE. HOW IS THIS LEGAL? Pennsylvania divorce law permits you to obtain a divorce decree outside the county of your residence if (and only if!) both you and your spouse agree to do so. Since you do not need to see the inside of a courtroom when both spouses agree to a divorce, with our kit you can legally file a Cameron County divorce action from anywhere in Pennsylvania, all without having to travel farther away than your Post Office. HOW WILL I KNOW WHEN I AM DIVORCED? The court will mail you a certified copy of your divorce decree at the end of your divorce process. This is the document that you must show if you should ever again apply for a marriage license, because that is your proof that you are legally single. YOUR CHILDREN ARE NOT A COMPLICATION! Rights involving children do not arise from your marriage, and so they are unaffected by divorce. Press “Buy Now” to purchase your $75 Pennsylvania uncontested no-fault divorce kit through Paypal, or call our office at 412-371-4500 to let us help you get started directly! When your purchase is complete, you will be taken to a page that will tell you what information we need to create your personalized do-it-yourself divorce form kit. If your husband will actively cooperate as needed, you are probably — probably! — looking at less than two months from start to finish, given the length of your separation. That said, it is always a hazardous matter to schedule a wedding before your divorce is final. I try to avoid tempting fate, and I have seen any number of situations in which something goes wrong. That said, if you start right away and if your husband cooperates as you expect, the odds favor your success within the time period you require. Whatever your choice, I wish you the best of success as well as the best of happiness as you open this next chapter of your life! Is the $98.00 for everything or is more fees on top of that? And how long do you have to wait to get remarried? The $98 is everything from our end. That gets you the kit, full instructions, and support from our office. The only other fees that you have to pay will go to the court, and currently those fees total $105. That breaks down as an initial filing fee of $86, and a “transmittal” fee (when you are ready to ask the court to issue your decree) of an additional $19. The moment your divorce decree is issued, you are eligible to remarry. There is no additional waiting period. You will end the process with a certified copy of your divorce decree, and that is what you will give to the clerk when you apply for a new marriage license, to show that you are single. Everybody needs to cooperate by signing the right documents for the kit to work, but only one of you has to be a Pennsylvania resident. As long as you live in PA and can get the documents to your husband to sign and return to you for filing, you’re good to go. So after the documents are all signed do they get returned to you or do they get filed in the county you live in? Neither one. The kit is set up for you to file your divorce in Cameron County, Pennsylvania. They have effectively declared themselves the divorce capital of PA, by allowing out-of-county filings and by keeping their filing fees so inexpensive that it’s almost always cheaper to file there, than to file in your home county. The kit comes with all the necessary correspondence pre-written and pre-addressed, and with an easy-to-follow checklist of instructions, so there’s no guesswork for you at all. From your answer, it sounds like filing in Cameron County is by mail. But to be absolutely clear, there is NO physical filing to be done in Cameron County, correct? I DO NOT need to drive there, only mail the documents there. I started filing divorces for clients in Cameron County around 15 years ago, and I’ve never been there myself. I’m told that if you’re into hunting, it’s very nice. Filing by mail is all that you need to do. The kit even includes the correspondence you need, already filled out and ready to go. The web site says $49 plus court filing fee but I see $98 referenced in some, of these questions. Can you clarify? We originally charged $98 for the kit, before deciding to make it more accessible by cutting the price in half (it worked!). The $98 is tied into the address of the page, and I’ve been hesitant to change it for fear of losing search ranking. I consider myself a very good lawyer but perhaps somewhat less-qualified as a web-designer! So you need the 98 plus the 105.my son was in jail in ohio for 612 yrs and now in half way house inPitts.Pa.They have been seperated for many yrs.They both want the divorce, she wants to get married agian. You are correct about the prices. The filing fee of $105 breaks down as $86 to the court at the time of filing, and another $19 when he is ready to file the final paperwork asking for a decree. If he has been in Pennsylvania for at least six months, or if his wife is also a PA resident, he is good to go; Pennsylvania requires that one or the other spouse, at least, be a Pennsylvania resident to be able to file under the Divorce Code. Your son will be using the “irretrievable breakdown” ground for divorce, and with his wife’s cooperation this can probably be finalized in less than two months. If your husband is “on board” with a divorce and you decide to use the kit, the total cost to you for the divorce will be $203, broken down as $98 to us for the kit, $86 to the court for the initial filing fee, and $19 to the court when you file the final paperwork asking for a decree. Taking back your prior name is easy. Once your divorce is final, we can take care of it for an additional $60. When you are ready to make that happen, just let us know. If your spouse is in agreement, and you decide to use the kit, it will cost you a total of $203, breaking down as $98 to us, $86 to the court to get the process started, and $19 to the court when you file the final documents to ask for a decree. For all the total costs for your kit and court costs how much will it run? The whole out-of-pocket cost, using the kit, totals $203. That breaks down as $98 to us to buy the kit, $86 payable to the Cameron County court to file the initial paperwork, and an additional $19 to the Cameron County court at the tail end when you file the final documents that request the court to issue your divorce decree. The kit contains all the correspondence to the court, pre-addressed, and the instructions tell you the amount of money the court needs and when it has to be paid. If you don’t know where he is and you have no way of reaching him, I’m sorry to say that the kit won’t work for you. If you have been separated two or more years and you are a Pennsylvania resident for more than six months, you can use the “irretrievable breakdown” ground for divorce that does not require his consent, but you will need to file in your county of residence. The biggest challenge that people in your situation face is getting the papers properly served. If you don’t know where he is, you no longer have a telephone number to reach him, and a diligent search cannot turn him up, it is possible to get a judge to agree to “alternative service” which can mean anything from getting permission to serve a close family member in his stead, to publishing the appropriate advertisement in two newspapers. I certainly sympathize with your desire to move forward, and you CAN finalize your divorce, but first you must overcome this particular obstacle. To do that, your best starting place might be to speak to a local family law attorney. My husband and I have been married for 3 years together for almost 12. We have 4 kids together. We are both willing to sign and divorce due to us realizing that we no longer are in love and have only stayed together for the kids. Since we are both willing to sign and live in pa the kit would work but what about the kids? What about custody agreements and so forth ? I think you may find my answer encouraging: in Pennsylvania, there is a sharp distinction between rights that exist because the two of you are spouses, and rights that exist because the two of you are parents. Rights between spouses (such as alimony and property division) are lost if they are not claimed or protected by an agreement before the divorce is final, but child custody rights are not handled the same way in Pennsylvania. The moment you involve a child in a situation, you have three people’s rights (or in your case, six!) instead of just two, and you can no more lose your children’s rights than you could lose my rights or your next-door neighbor’s rights. The courtroom door is always open to parents with custody issues to address, no matter whether they are married or divorced. Where kids are concerned, Pennsylvania courts usually take an “if it ain’t broke, don’t fix it” attitude. If you and your husband have worked out how things need to be, and you have established and maintained a good level of trust as co-parents, nobody is going to come knocking on your door to meddle. If you feel the need to address custody issues by means of a written agreement or an order of court, that is another matter; and in that instance, you will want to speak with a local child custody lawyer to get more information about your rights and options. Even then, though, there is nothing stopping you from handling the divorce out-of-county (but only if he will sign! ), and handling custody issues locally. If he will cooperate, and if you can get the papers to him so that he can sign them and return them to you, you’re good to go. If you are not certain of his active cooperation, though, the kit might not be able to get the job done for you, and you might want to speak to a local divorce lawyer, instead. There is no way to offer a meaningful answer to such a general question like that beyond, “Talk to a local Pennsylvania divorce law firm.” I don’t say this to be flip, but because I don’t know if there are property or support issues, or why she is refusing to sign. The cost is entirely dependent on how much work your divorce lawyer needs to do, as well as on the choices your wife makes. That said: if there is nothing else to fight for, and if all you need is the piece of paper that says you’re not married anymore, *and* if she isn’t going to step forward to do anything, she’ll just cross her arms and refuse to do anything, you can begin the process of divorce using the “irretrievable breakdown” ground and — if she does nothing at all — you are probably looking at about 2.5 months from start to finish. DO NOT USE THE DIVORCE KIT. It will not help you, since she is being uncooperative. Also, do not go to any of the “divorce mill” law firms that will file your case in Potter County or Cameron County. Your best bet is to go with a local lawyer who is willing to do an uncontested no-fault divorce for a fixed fee, and who will offer you a clear understanding of his terms if either (a) your wife decides to make trouble, or (b) if there are economic claims that need to be addressed before the divorce is final to make sure that there are no loose ends. Thank you for your feedback! I am very glad that your experience was a good one. I set out to offer the very best and most affordable do it yourself divorce kit in Pennsylvania, and I very much appreciate learning that it helped you to get the job done without difficulty. How long does it takes to be divorced? Using our DIY Pennsylvania divorce forms, it depends on how long you have been separated. With a separation of less than two years, you are looking at about four months from start to finish to finish your divorce process; with a separation of more than two years, you are looking at about two months or less. The difference has to do with the fact that length of separation determines which ground for no-fault Pennsylvania divorce you will be using. Prior to two years of separation you will use the “Mutual Consent” ground, and past that point you will use the “Irretrievable Breakdown” ground. I’m very happy with the divorce kit that I purchased from Attorney Greenstein. The instructions were very easy to follow, plus the low cost and in four months my divorce was final. All without ever having to contact the attorney’s office. It doesn’t get any better than this. I would recommend this to anyone who wants quick, easy and uncomplicated. Thanks so much Attorney Greenstein! Thanks to you for the feedback! We want people to succeed with our kit, and I’m glad to know that it worked for you. Do I need to file in west chest if that were the marriage license is from. No, it doesn’t matter where your marriage license was issued. Where you file your divorce has nothing to do with where you were married, and everything to do with either (a) where you and/or your spouse live now, or (b) where the two of you agree to file. It is the second of those two that allows our divorce kit to do the job for you affordably, when both of you are in full cooperation to obtain a Pennsylvania uncontested no-fault divorce decree. am I able to use this program if my husband and I own a house but I do not want any claims to the house whatsoever am I able to waive my right to the property? The answer is both “yes,” and “possibly not.” Yes, because if all you are after is a low-cost Pennsylvania divorce decree, and both of you are in agreement, the divorce forms and instructions will work just fine for you. Possibly not, because with real estate in the picture (with a mortgage, if you are like most people) you risk leaving economic loose ends that could come back to haunt you. It is important to understand that Pennsylvania divorce is as much about economic closure as it is about personal closure. Unless your (and your spouse’s) rights to property division or alimony are claimed through the court or protected by a written post-nuptial agreement before the divorce becomes final, the doors of the family court will be closed to you to address them, once your divorce decree is entered. Transferring ownership of real estate from two spouses to only one is easy; all you need to do is to create, execute and record a new deed that says so. If you are a borrower on the home mortgage, however, simply transferring the property to your husband will not take your name off the debt! For that, your husband almost certainly would have to refinance the loan in his own name, thereby relieving you of liability. So, here is your takeaway: if both of you are in full agreement you can take care of the divorce easily, but it is wisest first to make sure that you are fully relieved of liability for the house that you are willing to surrender to your husband. My ex and I are both willing to sign papers for a divorce. Do we still have to wait the 90 day period in between the filings or can we send everything at once and get it done faster? Neither one of us want to contest the divorce.we both want it done as quickly as possible to get on with the rest of our lives. If you have been separated for less than two years, I am sorry to say that you are stuck with the 90-day waiting period for a Pennsylvania uncontested no fault divorce. The “mutual consent” ground (which is the only no fault ground available to you if you have not yet been separated for a full two years) requires the ninety days as part of the process. If the divorce consent papers are signed before 90 days have passed from the date on which the Divorce Complaint has been filed, they will be rejected by the court. I have been separated for almost 10 years; we used a do-it-yourself kit to file for divorce in Pa in 2009, but it was rejected because something wasn’t signed at the correct time. A) would I still be able to use this kit? B) do we have to participate in the 90 day waiting period? C) approx. how long would you anticipate that the whole process would take? D) he just had a baby (not mine, in case that’s not clear), does that affect anything? Thanks! It may be that your 2009 case still exists, and can be finished; in my experience, there is little that can go wrong with a Pennsylvania divorce process that cannot be set right, when both spouses are entirely in agreement. However, some PA counties will dismiss unfinished divorces if too long has gone by without any activity. You might want to contact the Prothonotary’s Office in the county where you filed to see whether your existing process remains active so that you can avoid having to pay a new filing fee. A. Yes, you can use the kit if your spouse will cooperate by signing the necessary paperwork. B. You don’t have to worry about the 90-day waiting period, because that applies to the “Mutual Consent” no-fault divorce ground. You will be using “Irretrievable Breakdown,” the other Pennsylvania no-fault divorce ground (which requires a minimum of two years of separation), which should shave about two months off the process for you from start to finish. C. You’re probably looking at about two months or less from beginning to end. D. No, a new baby has nothing to do with the divorce. Child-related rights are unaffected by divorce, and divorce-related rights are unaffected by children except in ways that don’t apply when all you and your spouse are after is the piece of paper that brings your legal marriage to a close. Can u get divorce if they won’t sign?? If you have been separated a full two years or longer, you don’t need your spouse’s consent to be able to get a divorce; but if your spouse won’t sign, the kit won’t help you and you should not buy it. Our kit has you filing your divorce in Cameron County, Pennsylvania, and (unless you actually reside there) this will only work for you if you and your spouse are in active cooperation to sign the forms. If that is not the case for you, you are best advised to contact a divorce lawyer in your own county of residence. Do you need a copy of your marriage license to get divorced? There is no need to produce your marriage license. All you need is the information about when and where you were married, and you’re good to go. Will the kit be mailed to me or is it something that i will have to upload an print? Also i know how to contact my ex and i am sure she will sign but i don’t want her knowing my new address, does she need to have it or is my address already printed on the forms or can she have any signed papers dropped off to a mutual friend? Most often, we will email you two PDF documents: one is the actual set of forms, already filled out as much as possible, and the other is your set of instructions. If you prefer to receive these documents via regular mail, we will be glad to get them to you that way. If you want your address identified as confidential, please let us know and we will make sure to prepare the papers accordingly. I consider it good practice at least to identify your county of residence on the papers. There is no problem with any arrangements you make concerning exchange of the papers, so long as they are correctly completed and that all signatures are authentic. I have been separated for over 10 yrs, my husband is willing to get a divorce, and I know how you contact him, will this be a long process? Not too bad. You’re looking at about two months (give or take) in a situation like yours. I have been separated for 3 years now and have no desire to remain married. The issue is my spouse who is from Africa, refuses to sign divorce papers if served. I know where he works can I begin the process without his signature and how much will it cost if done through your office? You have been separated for long enough that he doesn’t have to sign the paperwork, provided that he is properly served and takes no further action. At the time of this writing, we should be able to get the job done for $300 plus filing fee (which varies from county to county) if you are able to get him served with what we file, or $500 plus filing fee if you would like us to arrange service for you, as well. The kit is for my boyfriend but am I able to pay for it using my credit card? Just want to make sure that the kit won’t come with my info on it since it’s not for me. Once you buy the kit, you will be directed to an information form to complete, so that we have the information we need to customize the kit for you. You can supply us with your boyfriend’s information and still use your own credit card to pay for it. There is a place in the Paypal payment form where you can put a note to us; if you can let us know who the kit will be for, it will be easier for us to see the connection between the payment and the completed form. You are also welcome to give us a call or drop us a note about that. I am looking to get divorced this year, I am hoping to file by the end of this month if possible. I got married in Delaware county and we been separated in different homes for two plus years. I read that in PA, you have to file in a county either spouse is living in. Is this true or could this work for me? You can also file in a county about which the two of you agree, if the county itself permits it (and Cameron County, where the kit has you file, does permit it). If at least one of you has been a PA resident for the last six months or longer and you are both willing to sign the consent documents, you can use the kit to bring closure to your marriage. Take a peek at the Pennsylvania rules of court concerning venue in divorce filings, and see for yourself. What’s the fastest i can get this completely done? If your spouse cooperates fully and promptly then you’re looking at four months, give-or-take (if you have been separated less than two years), and two months, give-or-take (if you have been separated for longer than two years). I don’t know your personal circumstances, of course, but I often have occasion to warn people NOT TO SCHEDULE A WEDDING UNTIL THEY ARE DIVORCED! The technical term for doing otherwise is “tempting fate,” and that’s something that’s usually a bad idea! I have only been separated since 5/2015. I left my spouse in NC (not sure if he’s still there) and I’ve lived in PA for 6 months. I have no intentions of a reconciliation and he will sign the papers. Do I qualify for the kit or would I need to contact an attorney? How long will it take for this nightmare to be over? You can use the divorce kit! Only one of you has to have been a bona fide resident of Pennsylvania for six months or longer. If your spouse is indeed onboard with obtaining a quick and easy divorce, you’re looking about about 4 months from cold start to divorce decree, give-or-take. I have been separated a little over a year, my spouse says he will sign the paperwork, but I am not certain he will once he has been served. What happens if he doesn’t. How will the process take in this instance. If he doesn’t, everything grinds to a dead halt if you have filed outside of your county of residence. The loophole in Pennsylvania divorce law that allows out-of-county filings when everybody wants the same thing only works when there is active consent from both sides. If he doesn’t cooperate and you have filed in Cameron County, PA, you will end up either having to transfer the matter to your local court, or (in the alternative) to dismiss it and re-file locally. Either one is likely to be more expensive than if you filed your divorce in your county of residence, in the first place. When in doubt, I generally advise people to file in their home counties of residence. My ex and I are in complete agreement for divorce but can it be stated in the divorce that I still carry him for medical, vision and dental insurance? You will be UNABLE to insure him as a spouse after a divorce has been granted. No court order or written contract can change that. I just did this kit started at the of beging of February. End of March I got the decree. I called almost on every step. They were always there for me. It works!!! I have ocd and these wonderful people answered my questions. I even called late at night I got an answer from the man who made up it. It works. Thank you for all your help to get this degree of divorce. It’s final!!! We did it ourselves minus the all the calls from me that you always answer. I could never say thank you enough!!!! Thank you, too, for your kind words! We’re glad to help, and I’m happy to learn that things worked out the way they needed to. I have been separated from my husband for about a year now. There is a pfa against him and a no contact order for the kids as he was very abusive. I dont want to have any of the custody changed by the divorce process that was put in place by the pfa for three years. Is this possible? If so how long will it take me to use this form to become officially divorced? Custody has nothing to do with divorce in Pennsylvania, because the right to custody doesn’t arise from your marriage. Parental rights have nothing at all to do with your marital status. That said, it doesn’t sound like your husband is feeling very cooperative. The kit will only help you if both of you are in active cooperation to obtain the decree; if he refuses to cooperate, you are better off filing in your county of residence. If he is onboard, you’re looking about about four months, give-or-take. The ground for divorce you will be using is “mutual consent,” and most of the time is taken up by a 90-day waiting period that will have to elapse between the date you file and the date after which you can both sign the consent forms. We are both going to stay on our house until my elderly mother is passed and I then move out or we sell. Is the fact that we are not arguing or selling or buying out the other person an issue. This arrangement works for us. Why did the price say 49 then I see 98? Whenever there are mutual obligations that are going to survive your marriage, it is usually a good idea to have them written up in the form of a contract. It doesn’t have to be prepared professionally, but it is usually a good idea simply because a marriage settlement agreement (also sometimes known as a post-nuptial agreement or a property settlement agreement) is as enforceable as if it had been a court order, and is not subject to change by a Pennsylvania divorce court unless the agreement itself permits it. If you’re locking yourself into an arrangement, it’s usually a good idea to get a professional perspective on what you’re locking yourself into. None of that stops you from using the kit, but since Pennsylvania divorce is all about the economic closure (the personal closure is up to you! ), it’s usually a good idea to be sure. We originally priced the kit at $98, but when we decided we would sell more kits if we cut the price in half (and we do!) I realized that we can’t correct the tab that says $98 without risking our search engine results. Sorry for the confusion, but the kit really is $49. yes i would like to know how long it takes to be divorced when everything is done? It depends on how long you and your spouse have been separated. If you separated less than four years ago, you’re looking at about four months, give-or-take; if more than two years, about two months, give-or-take. Either way, when all is said and done what you’ll have in your hands is a certified copy of your divorce decree, which is what you will need to prove that you are legally eligible to marry if you should ever apply for another marriage license. There is a lot of misunderstanding about how divorce works in Pennsylvania, and “the two year thing” is one of the biggest misunderstandings of all. There is no automatic divorce in Pennsylvania, although it seems likely that you can still bring closure to your marriage with reasonable speed as long as your husband doesn’t step forward to make trouble. Where the two years come into play is that after you have been separated for that long or longer, the Pennsylvania ground for divorce in your case will be “irretrievable breakdown.” Your husband’s consent is not required, but he still has to be properly served with the proper paperwork. Total elapsed time: two months, give or take. Make very sure that you need nothing from him such as property division or spousal support/alimony, because any rights arising from your marriage that are neither claimed nor protected by agreement by the time a divorce is final are gone forever. All of that said, since your husband will not cooperate our divorce kit will not work for you. Our kit only works when both spouses are in full cooperation, so you will want to speak to a local divorce and family law attorney about filing your divorce in your home county and having it properly served upon your husband. I purchased this kit for my boyfriend who had been separated from his wife for almost 8 years. There was an initial mix-up where they sent us the wrong kit but they corrected it immediately when my boyfriend contacted them. The initial paperwork was mailed to the prothonotary’s office in mid-March. After all was said and done, the divorce was finalized May 23, 2016 and we received the final decree in the mail about a month later. It might have gone a little faster except that his spouse took a little bit until she finally signed and mailed the papers back to us. Very pleased with the whole process and the help they provided if there are any questions (which is how we figured out that they sent us the wrong kit). Definitely would recommend for anyone looking for a simple no-fault divorce if both spouses are willing to sign. Thank you very much for the kind words, and please do accept my apology for the mixup! I am glad to know that things worked out for you. Best of luck for the future! No problem! Mistakes happen, we’re all human! The fact that it was corrected immediately made up for it. Thank you!! I filed for divorce in March of 2015. My spouse will not agree. We’ve been separated for 2 years. I’m still currently paying apl. What do I need to do from here to get this divorce done to end the apl. Your spouse has no motivation to move things forward, because you’re paying her every month to do nothing at all… and she’s doing what you’re paying her to do! You will need to proceed under the “Irretrievable Breakdown” divorce ground. If economic claims are pending they will have to be addressed as well, but first you almost certainly will need to establish grounds for divorce so that the court can address them. How best to proceed can vary from case to case, depending on the situation, the procedural status and history, and your own goals. Custom challenges in divorce generally need custom solutions, so your best bet is probably to sit down with a local divorce lawyer who can go over your rights, options and risks with an eye toward laying out a course of action that will let you finalize your divorce process. Some things you can do yourself, but for most people the right tool for the job is help from the person who deals with this sort of thing every day. Would this kit work if the person filing was incarcerated? As long as that person can sign his or her own documents, and as long as his or her spouse cooperates, it doesn’t matter (for this purpose) whether the person filing for divorce lives at home or in prison. Is this a legal divorce or is there something I would have to do? Would I have to appear in court or physically go file? It’s a legal Pennsylvania divorce. As long as you and your spouse are in full agreement and cooperation, and there is nothing either of you are after from each other besides the divorce decree that says you are now single, our kit will work just fine for you. The page above will tell you what you need to know to be able to decide whether there are any complications that might stand in your way of handling your own uncontested divorce with our forms. You will be filing your divorce by mail, so there’s no need to travel farther than the nearest mail box. How long will it take till the divorce take till it all done and settled with. It depends on how long you and your spouse have been separated; if less than two years, you’re looking at four months from start to finish, give-or-take. If you have been separated for two years or longer, you’re looking at more like two months to finish your divorce and obtain your decree, give-or-take. The difference has to do with which of Pennsylvania’s two no-fault divorce grounds you will be using, and length of separation is how we identify which one to use so that we can provide you with the right materials to get the job done as quickly as PA divorce law permits. My husband and I have been separated for 2.5 years. We seaparated our finances and lives at that time. However we share a home (rented). How will that affect our divorce (time wise)? Not if you agree about the length of your separation. Whoever ends up doing the filing will (among other paperwork) file with the court a statement of when you separated, and that you have lived separate and apart for at least two years. If the non-divorce-filing spouse doesn’t challenge that, it’s good enough for the court. No one will care that your address is the same. I am married to an American but I am from the UK can I still use these documents?? As long as at least one of you has been a bona fide Pennsylvania resident for the last six months or longer, you’re good to file in Pennsylvania. Does this also work for York county? The kit is set up to file in Cameron County, which has pretty much designated itself the divorce capital of Pennsylvania by keeping its filing fees low and dispensing with a residence requirement. You can live anywhere in Pennsylvania and legally file in Cameron County, provided that you and your spouse both will cooperate to obtain your divorce and that neither of you are looking for anything more involved than just getting your divorce decree and calling the matter done. me and my husband been separated for 8.5 years how long will it take for divorce to be done? You’re looking at about two months, give-or-take, if both of you are prompt about signing and filing the necessary consent forms, but there is no way to guarantee that a divorce decree will be awarded by any given date. I sometimes work with people who have scheduled weddings before they are divorced. Some of them have gotten married on schedule; and some of them could not. I always urge clients to avoid tempting fate. How long will my kit take in the mail bc I order it two ago and still never got it yet . Kendra, we have sent you several emails since we received your order, trying to get the information from you that will let us create your kit. Please check your spam filter, or (if you don’t find them) please call our office. We turn kits around quickly, but we need to be able to communicate with you reliably to complete your purchase. Do all paperwork have to be notorized? None of the divorce paperwork needs to be notarized. It just needs to be completed and signed as indicated, and the instructions cover everything. If you get stuck, call us and we’ll help you! So for the $98 cost for using you for the kit, the initial fee is of $49 is due right away, when does the remainder of the the $98 due? It isn’t. We lowered the price to $49 and kept it there. I have been hesitant to change the “$98” figure so as to avoid losing search ranking for the kit, but perhaps someone who is web-savvier than I am can tell me whether that’s a pointless concern. As search-engine practitioners go, I make an excellent divorce lawyer. I just want to know do I need an address for my husband that I have been separated from since 2005??? I am willing to sign I just would like to move on with my life. Your husband needs to sign, too, for the kit to be able to work for you. Otherwise you will need to file in your Pennsylvania county of residence. If your husband doesn’t want to surrender his street address but is willing to sign the paperwork, as long as you have a way to get it to him (and as long as he signs it and returns it to you!) you’re good to go. Hey this is Kendra Zies I need to know how much longer it will take bc I waiting on the kit and all so could someone contact me please. We have sent you numerous emails, starting immediately after you purchased the kit. I responded to you here weeks ago and asked you to call our office. One way or another, we need you to respond to us so that we can get the information we need to create your kit. If you use our PA divorce forms, you won’t be filing in either Erie or Clarion Counties; you will be filing in Cameron County, which has filing fees (at the time of this writing) totaling $105. Including the $49 cost of the kit, that makes your total out-of-pocket expense $154. This is why I tell people that they can almost certainly use our do it yourself divorce papers and still pay less than if they were using free divorce forms and filing at home! When everyone agrees there is no need to travel to the courthouse, meaning that you can file your own Pennsylvania divorce by mail. Are these legal divorce papers? Entirely. But don’t take my word for it; there are links to reviews of our firm at the top of the page. Reviews of the kit itself are mixed among the comments above, and you will find more on our Facebook page. My husband and I agree to a divorce. We agree on him keeping his house, and me keeping my possessions and retirement. Are you able to do a marriage settlement agreement at an additional cost that would highlight the terms that we agree upon just so it’s in writing? And also, I am planning to buy a house of my own. Do I need to wait until we are fully divorced to do so, so that he is not attached to that property? We are a full-service divorce and family law office located on the east end of Pittsburgh, Pennsylvania. We can certainly draft a marriage settlement agreement for you (sometimes called a “postnuptial agreement”). Agreements of this sort are both binding and enforceable in Pennsylvania, every bit as much as if they were the court’s own order, and I usually recommend that they conform to what I call the “four Cs” of contract drafting: clear, concise, complete and comprehensive. These contracts represent the economic closure that Pennsylvania divorce is supposed to bring. In the context of the need for an agreement when using the kit, I have some particular cautions. First, the kit has you filing your divorce in Cameron County, PA, and if you ever have to enforce your agreement (which I always have to assume for purposes of drafting) you will want to enforce it locally. In that instance it would be necessary for you to register your Cameron County divorce decree in your county of residence as a “foreign decree.” This is not especially problematic in that instance, it just involves that additional step and the payment of a filing fee. Additionally, I recommend highly that the agreement be finalized BEFORE you file your divorce, so that if you hit a snag you have left all of your options open. However you decide, the agreement most certainly should be in writing. Samuel Goldwyn is quotes as having said, “A verbal contract isn’t worth the paper it’s written on,” and so do I. It is difficult to offer you any sort of definitive advice about purchasing your own home, knowing next to nothing about your situation, but if you choose to do so before an agreement is in place I urge you (at the very least) to be prepared to document the source of all funds you use in connection with the purchase, and to make sure that those funds are in no way “marital” as that term is defined in the Pennsylvania Divorce Code. We presently charge a flat $600 to draft this kind of agreement, including a meeting between us (either in person or via videoconference) to go over your needs, your goals, your risks, etc. If you decide that we can help you, please do give us a call and I will be glad to address the matter further with you.